Just like cats and spiders, the representation of blood-sucking vampire bats is often seen in seasonal decor and festivities this time of year. But in actuality, bats are very much a part of everyday life in a variety of urban areas across North America, completely oblivious to their role in All Hallows Eve celebrations. Read on to learn more about how these often misunderstood animals are adjusting to life in cities. It can be awkward explaining to a police officer why you have 25 bats down your shirt, but it’s all in a night’s work for biologist Cylita Guy of the University of Toronto, Canada. She spent the past two summers studying big brown bats in Toronto’s High Park, where some summer nights were a bit too chilly for her small, fury research subjects. To save energy, the bats slipped into a mini-hibernation called torpor, and then they couldn’t fly. “We had to warm up all the bats that we caught, and that’s how they ended up in a bag in my shirt,” she explains. Along with her fellow researchers, Guy braved police interrogations and other late night encounters (drunk teenagers, unspecified animals growling in bushes at 3:00 am) in an effort to better understand how bats use urban habitats. Many bats species are at risk, especially from diseases like white-nose syndrome and from other threats like habitat loss. Cities could play an important role in their survival, and the more that is known about bat behavior in these settings, the more informed conservation efforts will be. “Although we know which species of bats are in cities, we don’t have a good understanding of what they’re actually doing, and how these landscapes are shaping or changing the way they behave,” says Guy. They may not act the way they do in non-urban settings. For example, the team theorized that High Park, with its abundance of tall, old trees, and several ponds, would be a great bat habitat — especially for mothers with babies who need access to good food and roosts during the summer months. Instead, they found a lot of male bats, which was “really odd,” says Guy. While females did appear to use a few “hot spots,” they didn’t use the park the way the team expected. In fact, none of the bats being tracked through radio-tags attached during capture lived or roosted in the park during the day. Instead, many of them appeared to spend their days in residential areas that border the park, likely in houses, sheds and trees. It was hard to confirm exactly where in people’s backyards (or homes) the bats were. Many residents didn’t believe bats could be living so close by, says Guy, “So they wouldn’t let us investigate.” Regardless, why would the bats choose these locations over what appears to be great habitat in the park? Guy says there are many factors to consider, including the availability of different species of insects, or preference for different water features. With the data they collected in the field, the team is running computer simulations to try and figure it all out. What they find will also be of interest to Guy for the other work she does — studying bats as potential reservoir species for human disease emergence. 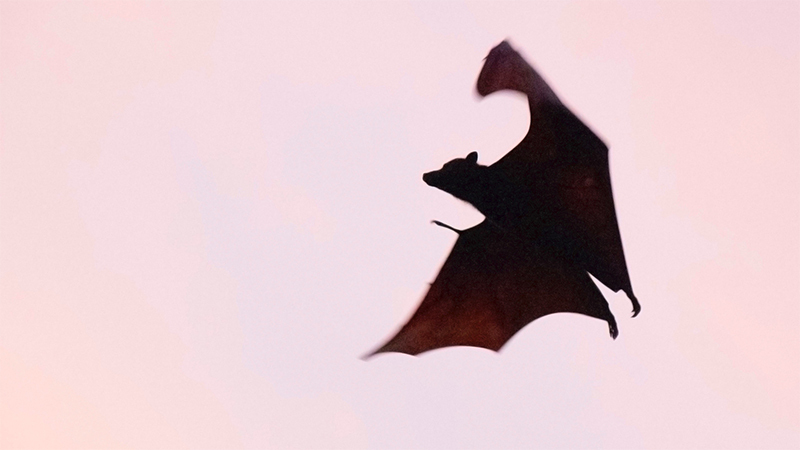 Disease-jumping from bats to humans is more of a concern in the tropics, and it’s unlikely a pandemic would start in a big brown bat population, says Guy. However, her work in Toronto “provides a good model system for examining what behavior looks like in these areas of potential spillover.” She hopes the information will help manage bats in cities and benefit the animals themselves, but also minimize risk to humans where they coexist.